"Whoever sees evil should set it right by means of his hand; if not, by his tongue; if not, then by his heart and that is considered to be the weakest of faith." then there is no hope in them." Before Moses went to the demand the freedom of the captive slaves of the children of Israel, Moses had two choices. Once choice was to be among the Egyptian power-structure, to be part of that structure which made the mighty Kings as gods who were worshiped; where pictures of kings, prince and queen were made to be inscribed on the Pyramids, on grand palaces by the very slaves who were demanded to bow down before those Kings, Queens and their icons. It was a sanitized, so called ‘religiously’ holy regime where Moses could find himself easily as being one of them, after all he was raised by the Pharaoh’s wife as one of the family members. The other choice was less sanitized and less glamorous. It was the role of a person of truth with just demand to free the slaves, to ensure their human rights and freedom. He decided not to bow down to this morally corrupt power structure that made themselves oppressors and enslaved hundreds and thousands against their wills, constantly murdered their men, children and women whomsoever they wished in blink of an eye. So he left the corrupt palace, left the land of Egypt to an uncertain direction of the east only to come back inspired and aspired to free the oppressed and dehumanized slaves. Just imagine how dare he had to be to face the King who ruled as god on earth to demand the release of the slaves – all of them! If there was anything that is more telling about the mission of Moses, its exactly this episode of his siding for the oppressed against the mighty oppressor. He stood against the sanitized illusion of falsehood and stood for the burning fire of truth, justice and freedom; and it was literally from a burning divine fire that he received his inspiration to speak out and firmly act against the greatest narrative of human injustice of his time. 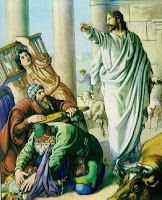 When Jesus Christ entered the main temple of Jerusalem and saw it have been made into a place of immoral business transactions, where the so called “people of religious garb” were robbing people, monopolizing the religion, abusing the rights of the orphans, poor and widows of the society – he didn’t became part of that corrupt power structure as one of them. Rather it was he who drove out all those who were buying and selling there, overturning the tables of the money changers and even the benches of those selling doves. His overturning of the table of money changers in the temple, which was part of concrete mechanisms of oppression within a political economy that doubly exploited the poor and unclean (those who suffered from leprosy). Not only were they considered second class citizens, but the temple obliged them to make reparation, through sacrifices, for their inferior status - from which the marketers profited. Jesus utterly repudiated the temple state, which is to say the entire socio-symbolic order of Jewish power structure. His objections have been consistently based upon one criterion: the system's exploitation of the poor. He could well also be a Rabbi just like the Pharisees – as he was often called by such title as Rabbi. Even many senior Rabbis of his time accepted him as a major religious leader because of his genius and knowledge of the Jewish sacred laws. But he didn’t side with the falsehood and social injustice that was widespread. The high authorities of the temple were the seat of power in all sense in that particular society where Jesus was living. They were authority in politics, social and religious matters. Thus when Jesus Christ spoke out against the corrupt Pharisees, it wasn’t only about religious hypocrisy he was protesting, he was speaking out against rampant social, political and religious injustice and hypocrisy. Many have systematically undermined the role of Jesus Christ as a fierce advocate of social and political criticizer and radical advocate of reform. He was not even interested in religious identity that was unjust to the common people of the society; nor was he interested in religious hypocrisy that the organized religion of his time was pressing on to people and using as manipulation tool for their own selfishness and greed. It was precisely because of his speaking out against the (political and social) corrupt power structure that he had to pay his price that he paid at the end. It was neither about theological position nor about anything religious, (although it was painted that way for convenience in the trials) but it was exactly about his speaking out against injustice and exposing the lies and hypercritical nature of the power structure that led to his trial and what followed afterward. It was the sword of justice and freedom that was the reference Jesus was making symbolically. And he demonstrated it and witnessed in its full glory and perfection by siding for the oppressed in his embracing of the fate of an oppressed. If there is any greater teaching in the elevated sacrifice of Jesus Christ, the teaching is to be on the side of justice, to be on the side of truth and never to be afraid to speak against oppression. The world has always had those overly greedy; ‘dog eat dog’ people who are never satisfied and who go on devouring constantly by oppressing others, specially the weak and poor ones. There was not a single time in known human history when one group of people didn’t unjustly dominate another group of people by oppressing them, by invading their lands, robbing their human dignity, making them humiliated or made them into slave. The most recent phenomena of this trend is to bomb ‘the other’, to use a very convenient term called “terrorism” and looting their land (invasion and occupation) and what is below their land (oil and gas) in the name of ‘spreading democracy’. This is a pitfall of human greed and oppressive nature that becomes a monster when a society is unjust and at the same time its knowledgeable, able people decide to be mute against such injustice. When people of conscience become deaf and blind to the injustice this monster becomes uncontrollable. But whenever an enlightened world teacher has appeared among the humanity, their birth has always happened amidst the oppressed and its precisely their speaking out, standing against the oppression was the acid test of their character. We see that very role in the life of Moses, we see that that very role in the life of Jesus and every single enlightened world teacher you can think about, you will see their role as someone who always strived to bring social justice, to bring unity among people and irradiate social, political and religious injustice. There is not a single exception to this. Somehow we have developed this dualistic view about religion that its so utterly private that religion is all about a private relationship and it has nothing to do with society or people. Somehow we have convinced ourselves that spirituality is all about feeling good privately while not realizing how stupidly ignorant and selfish such attitude is. This notion is a far away from how and what the major teachers of all world faiths held in their core of being. For them religion and spirituality has always been about human relationship, about building up a society or community based on ideas of equality, unity and harmony of people. Not a single religion is there that didn’t speak about equality and justice, because without justice there is no peace. And without peace in the community, society and mankind the private consolation of peace by mock spirituality or religious disguise is simply a disguise. Somehow we think that peace is an abstract idea and itself is the starting and end point of a human being’s relationship with God, therefore that’s all about religion or spirituality. It’s nothing but an example of our delusion about ideas of religion and spirituality. This is exactly the kind of view point which creates religious fanatics who disregard humanity and human relationship and think its ok to kill people to please God or its ok to kill certain group of people because they are immune by being so called chosen people of God. If your neighbor is afflicted and you turn away from it, all your devotion and lighting candle to an altar at your home or church means nothing. If you have failed to love for your neighbor what you love for yourself, meaning the human beings of the human family - you have failed to recognize the Divine who dwells in every human being. If the unjustly killing of other human being somehow, somewhere make you think it doesn’t matter and you can go about your religious devotion or spiritual meditation practice or your yoga class without being concern or take an action about it, then you haven’t understood what it means to be human and religious or spiritual in that matter. The invaluable saying pregnant with great mystical meanings that 'whosoever take the life of an innocent person, it is as if he has killed the whole of humanity' - is the burning statement of oneness of humanity through the divine bond. Just as the pain and affliction of one part of a body is felt through all over the body, in the same manner the pain of your neighbor, the pain of any section of humanity if not echoed in your human heart, you have not only failed to reach the meaning of your human birth, you have also failed to realize what oneness mean in its human archetypal sense. As it is taught in the sacred tradition: “When you see an injustice, an evil - prevent it by physical, active participation in a way you are able; if you are unable to participate physically then speak out against it and if you are even unable to speak out, then in your heart protest against it (know that its wrong and unjust).” May all of us become a voice against any injustice imparted to any section of human race no matter who take up the role of becoming the oppressor and no matter who in the human family is the victim / oppressed. May justice and freedom bring peace to the one human family. 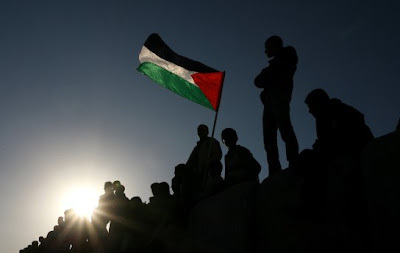 May whole of Palestine, the holy land be free from all oppressions and may peace descend upon the city of peace, Jerusalem and its neighboring towns and cities and villages. May all the inhumane walls erected to cause sufferings to civilians and to create ghettos and concentration camps - come down. May this year be the year when Palestinians have their own free state and their full right of their motherland. If there is any meaning.
. Whats happening in Gaza, Palestine?